I use thin strings and really like the .068 and .088 yellow and white ones. 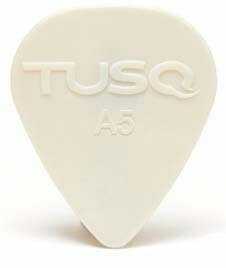 Drop a nylon pick on a table and then a tusq. The nylon has a soft dull thud. The tusq rings like glass. More upper partial overtones that can apparently transfer to the strings. Louder and brighter.